Trips are so much fun but not in your own driveway! Trip hazards to this extreme really need to be repaired. 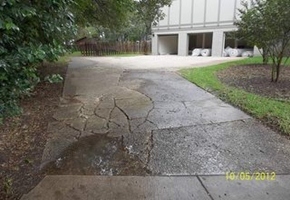 Dallas Professional Home Inspector, Chris Goggans, made sure that his buyer was aware that this is more than just a bad looking driveway it also is a hazard to himself and his visitors. Make sure you book your home inspection with Realty Inspection Services so that you know what your new home has to offer you!